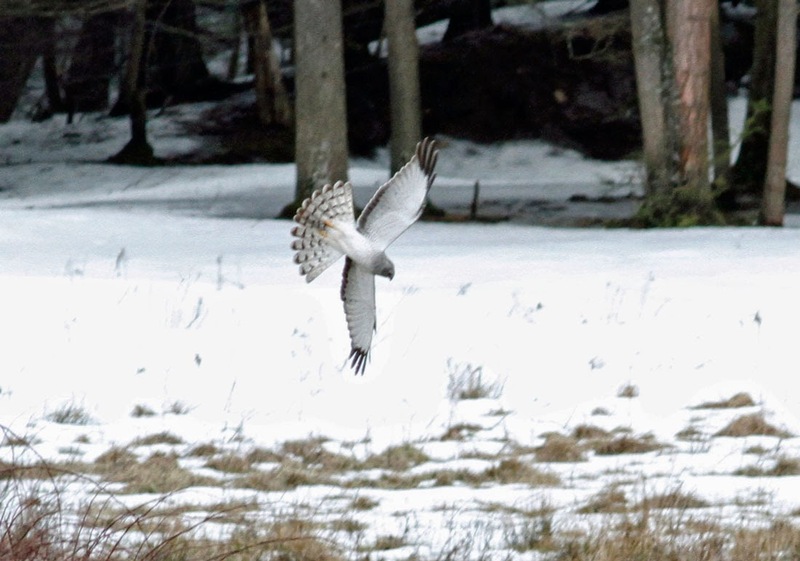 On Saturday afternoon Susannah woke me up from a mid-afternoon doze with a sudden cry of "male harrier over the field". 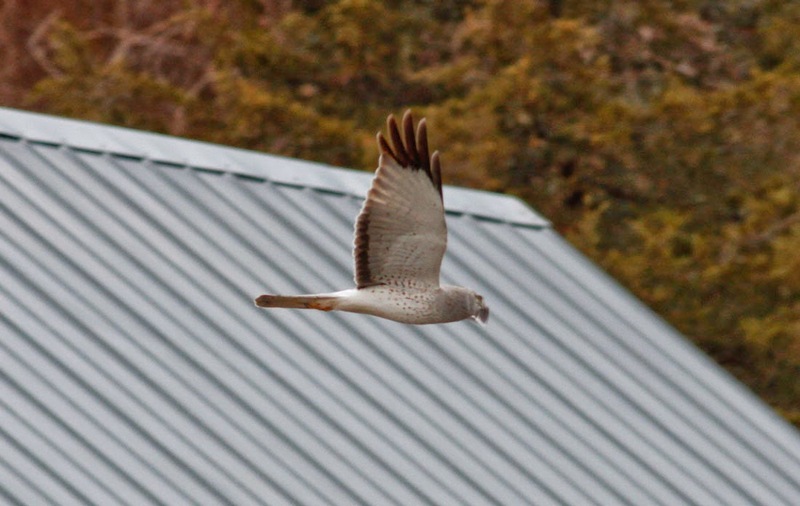 Sure enough, a beautiful male Northern Harrier was quartering over the meadow behind the house. It was our first in Gill this year, certainly a migrant, and present for just a few minutes before 'tanking' through the yard and heading straight through to the north-east......and that was it - all over in just a few minutes. About our 7th record since September 2010, most of which have been juveniles in autumn. 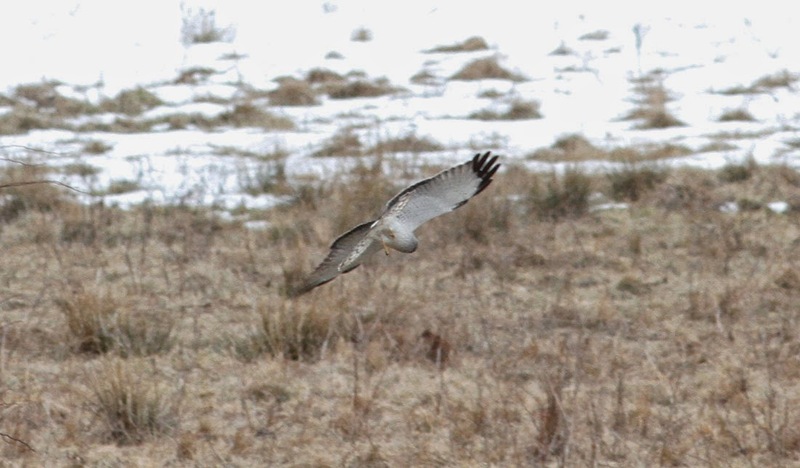 Northern Harrier - male, Gill yard, Franklin Co., MA. March 29th, 2014. According to the weather forecast, I reckoned I'd have about 90 minutes for a short outing before the rain started in earnest around 10am, and that's pretty much how things worked out this morning. 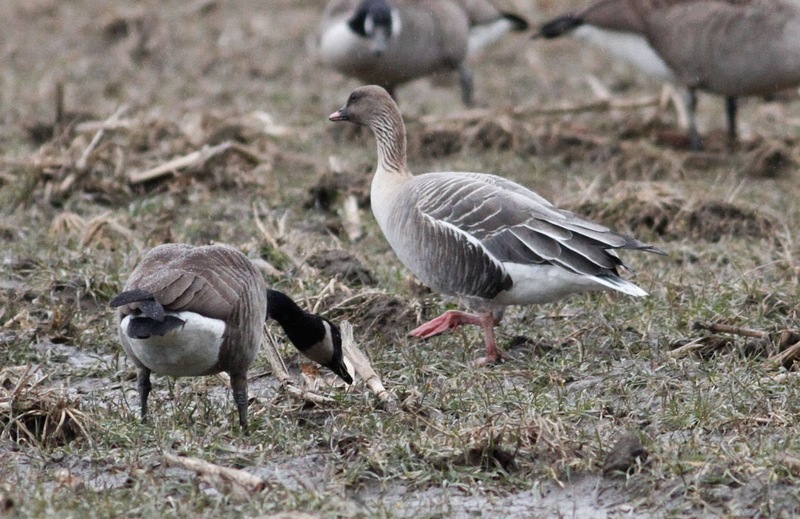 During the week I'd been impressed how local and visiting birders had kept tabs on the Pink-footed Goose found by Larry Therrien last Sunday (03/23). I dipped on Monday in a half-hearted effort in Hatfield but felt that my chances would be better this morning. Naturally, I was delighted to find a tiny group of birders already watching the bird in fields off Knightly Road when I arrived at about 09:10hrs. 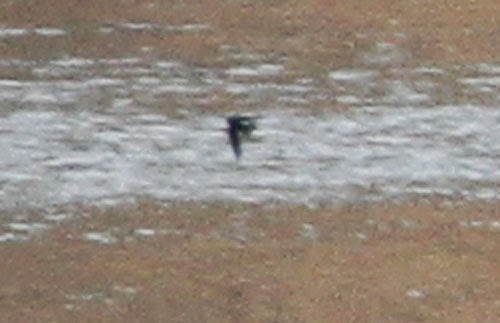 From that moment on I, and several local and visiting birders, had the bird in view for well over an hour. 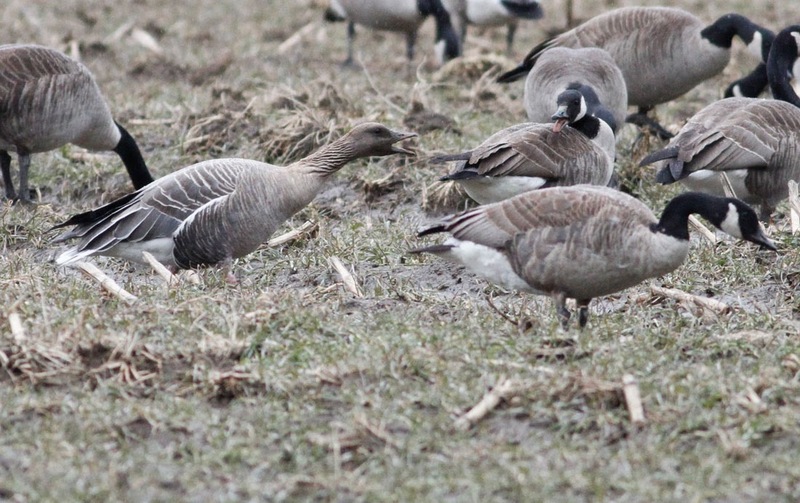 The best technique appeared to be pick a spot by the road and wait for the Pink-footed Goose to walk towards you because that's exactly what it did! At one point it was very nearly the closest goose to Knightly Road while the bulk of c.1200 Canada Geese foraged much farther out in the fields. True bill color often hidden by mud stains. Often aggressive towards neighboring Canada Geese. 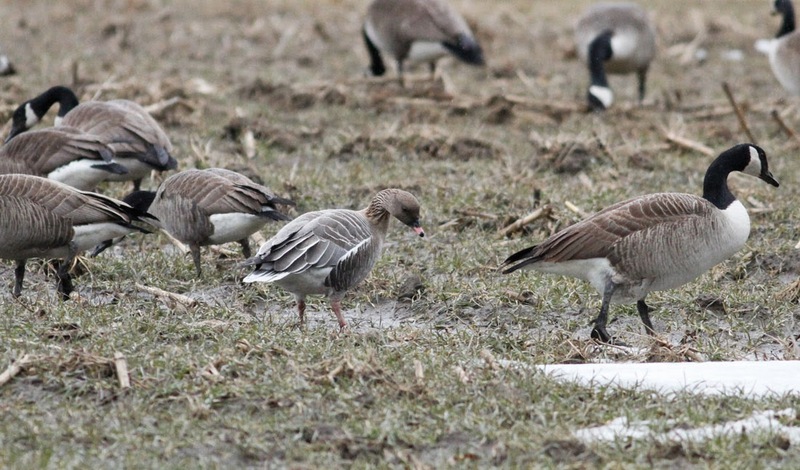 Pink-footed Goose - Knightly Road, Hadley, Hampshire Co., MA. March 28th, 2014. 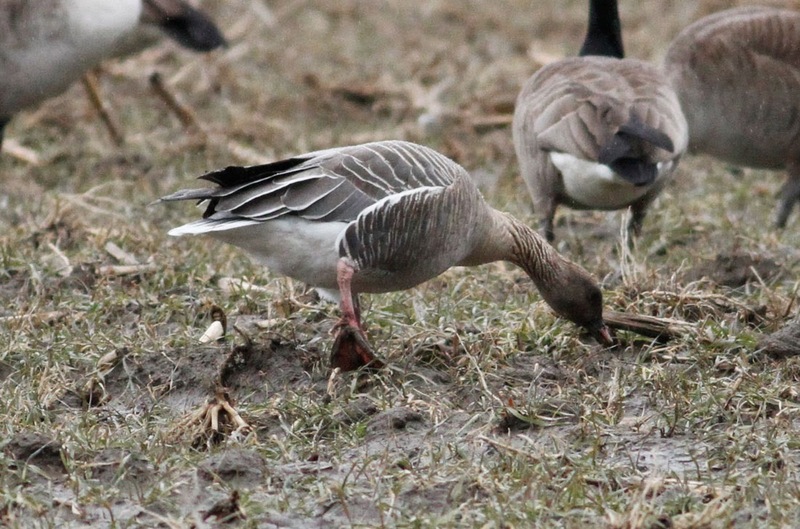 Probably the bird found by Larry Therrien in Hatfield on March 23rd, though there was speculation at the scene today that as many as three Pink-footed Geese maybe in the Pioneer Valley between Hadley and Longmeadow. An ABA Code 4 species and about the 6th or 7th state record for Massachusetts. 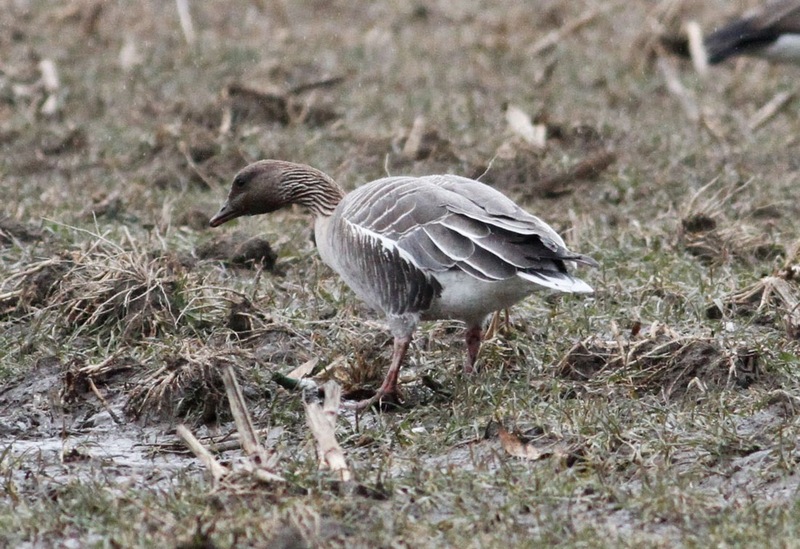 Also present, a minimum of three Cackling Geese, two of which were fairly classic hutchinsii (Richardson's) but another was more ambiguous and I thought looked better for taverneri (Taverner's). More on that later once I've been through my images. Yesterday provided a pleasant break from the norm when I was joined by visiting Belgian birder Martin Boer. Although we initially planned an owl/woodock start to the day, the frigid pre-dawn temperatures were enough to put us off and we met at the rather civilized hour of 06:30am. From there we scoured numerous sites along the Connecticut River Valley beginning at the Turner's Falls power canal, heading as far north as Vernon Dam, Vermont before returning to finish at Barton Cove, Gill. 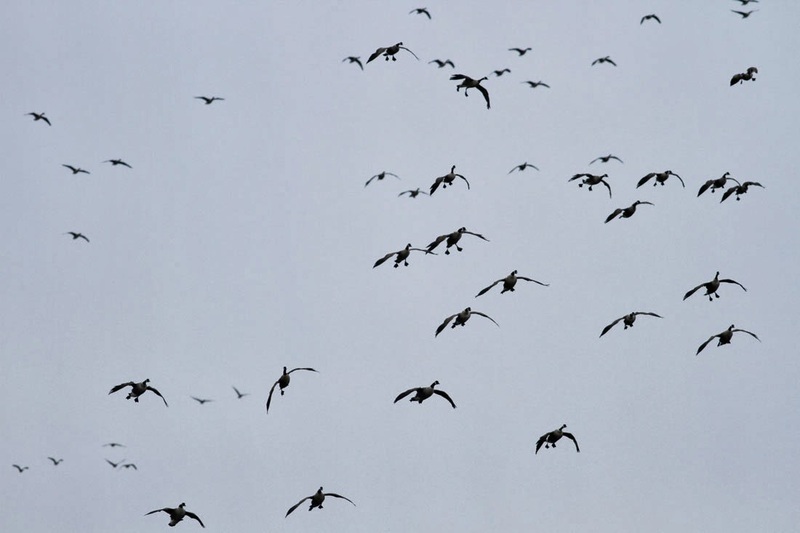 It turned out to be a fantastic day with large numbers of birds greeting us at almost every stop. 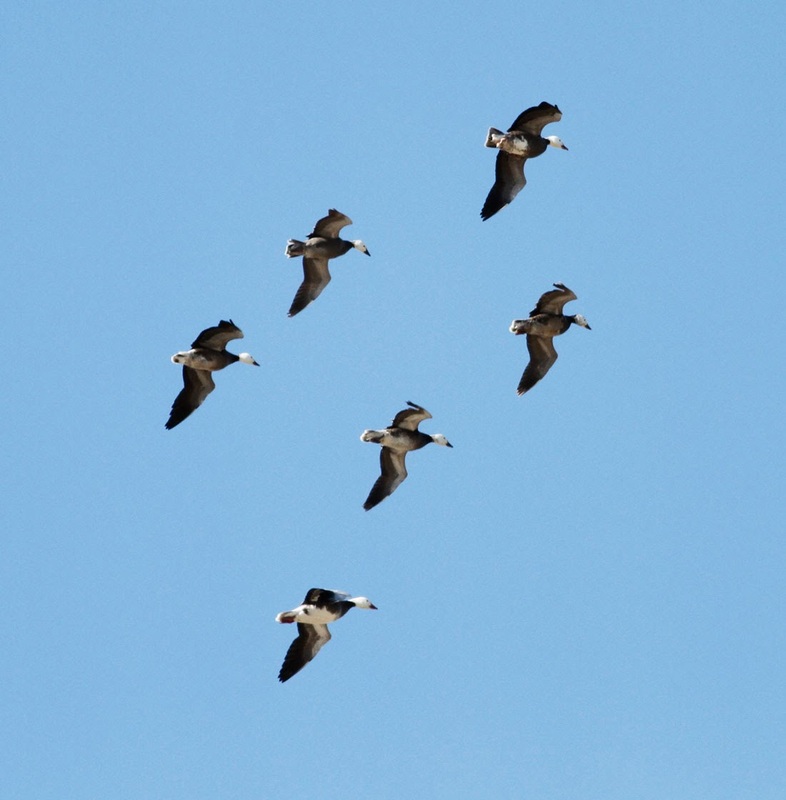 In particular, Canada Geese featured throughout the day with the largest numbers at Vernon Dam and later, a huge flight of birds over Barton Cove heading for the Turner's Falls power canal. In West Northfield and Vernon it seemed like every patch of open grass was filled with American Robins and with them Brown-headed Cowbirds (and Starlings!). We also had great looks at Killdeers in West Northfield, Horned Larks in Vernon and all the continuing waterfowl at Barton Cove. The day got off to a terrific start with six calling Fish Crows flying over the main parking lot at Turner's Falls power canal, only my third local record. Martin's sharp eyes soon picked out a drake Northern Pintail among the Mallards in the early morning gloom, and minutes later we were looking at three drakes together! 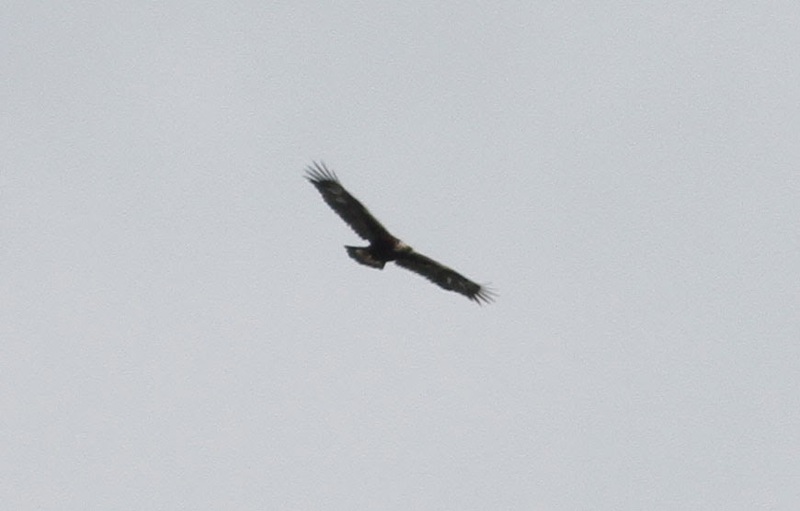 But our personal highlights came later in the day with a Golden Eagle over the Connecticut River at Vernon, VT, and a drumming Pileated Woodpecker at Ben Hale Road in Gill. Ironically, we only found the Golden Eagle after Mike Resch gave us a spot to try for Carolina Wren. It was pretty astonishing to step out of the car hoping to hear a Carolina Wren singing only to be confronted by a Red-tailed Hawk mobbing a sub-adult Golden Eagle! 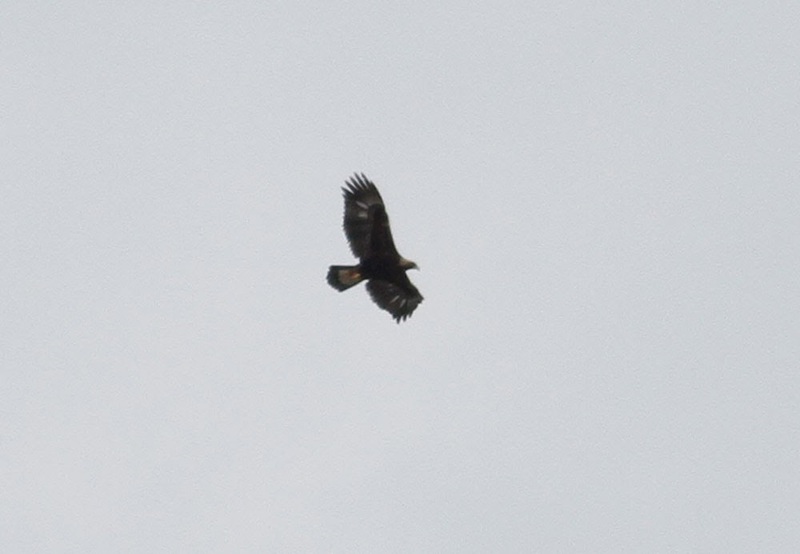 Just a couple of hours before I'd read a post from Hector Galbraith describing a sub-adult Golden Eagle over Vernon Dam the previous evening but I really wasn't ready for the same bird to still be around on our day......amazing! 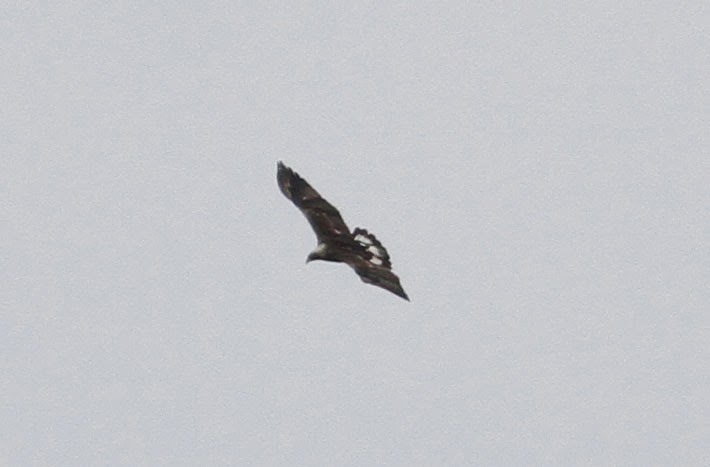 Only my third Golden Eagle in the CT River Valley since 2005. Exciting though this was for me, Martin had seen Golden Eagles before and his big highlight came half an hour later with the Pileated Woodpecker. This bird had been on our minds all day after we heard, but did not see, a drumming Pileated at Turner's Falls first thing in the morning. A brilliant day with great company ended on 43 species, all of which we saw well......no fleeting glimpses or 'heard-only' birds for us! Being mobbed by a local Red-tail. the eagle is over the CT River. 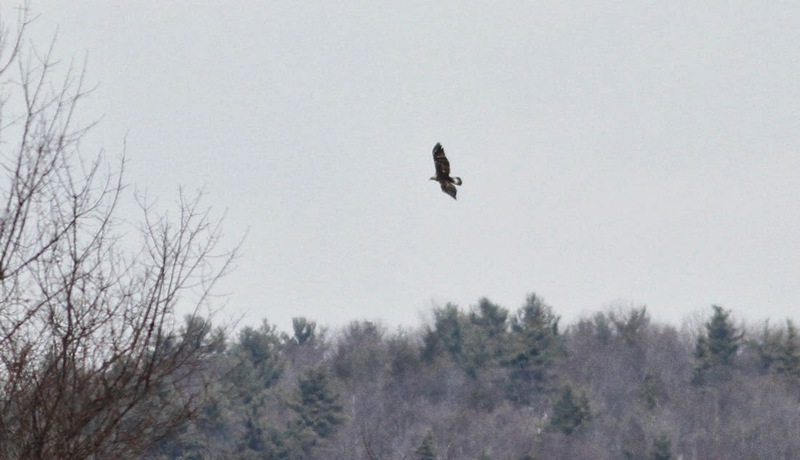 Golden Eagle - from Stebbins Road, Vernon, Windham Co., VT. March 25th, 2014. 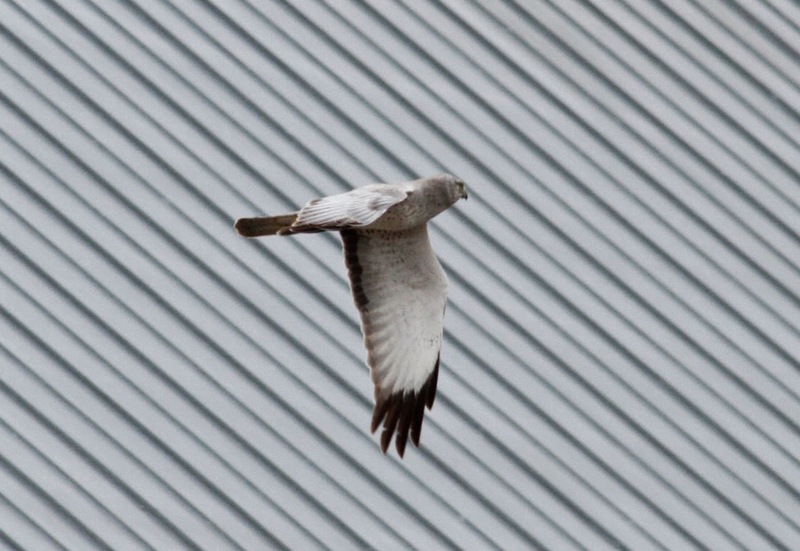 Sub-adult, first seen by Hector Galbraith on March 24th, 2014. Fish Crow - Cherry Rum Plaza, Greenfield, Franklin Co., MA. March 26th, 2014. 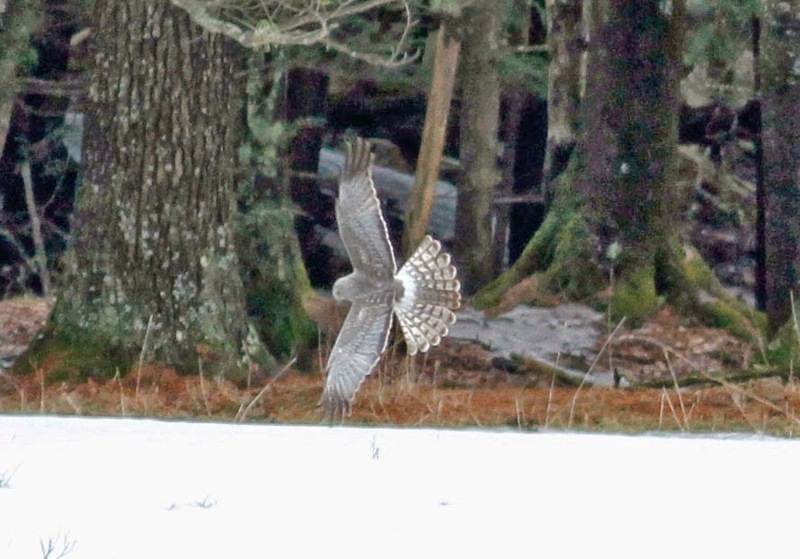 Could this bird be one of six seen dispersing from roost at Turner's Falls on March 25th? 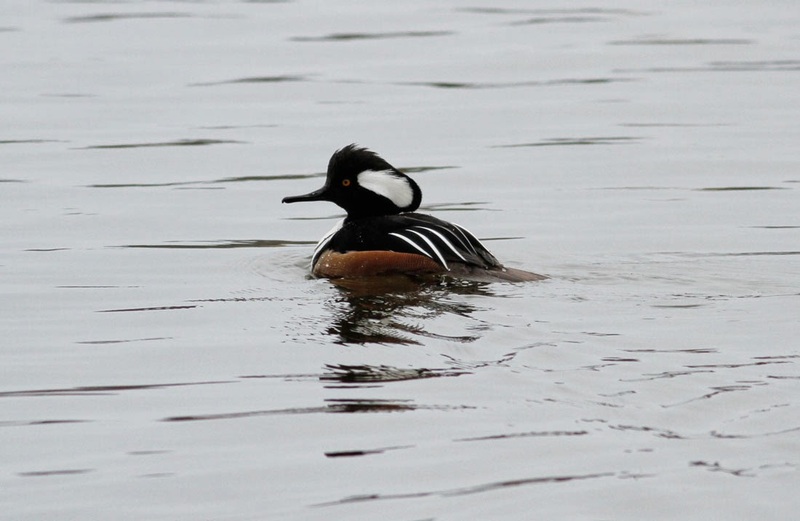 Hooded Merganser - male, Turner's Falls power canal, Franklin Co., MA. March 25th, 2014. Every stop on the Connecticut River produced this species. 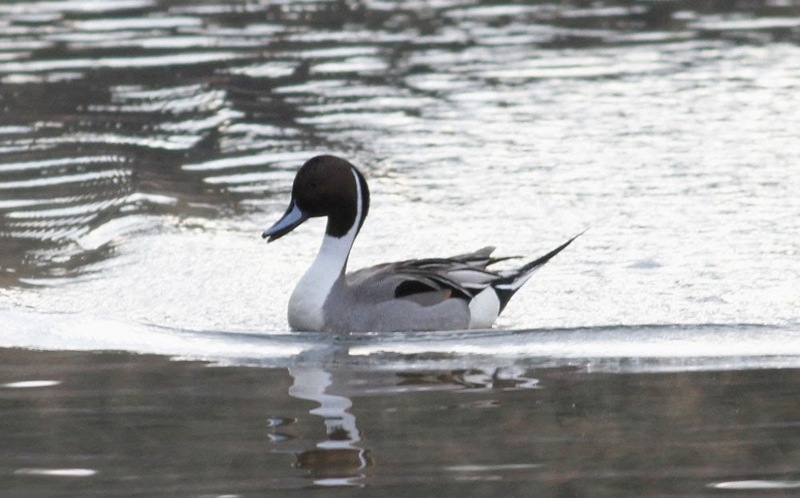 Northern Pintail - male, Turner's Falls power canal, Franklin Co., MA. March 25th, 2014. A fine morning for these with four males seen on the power canal. 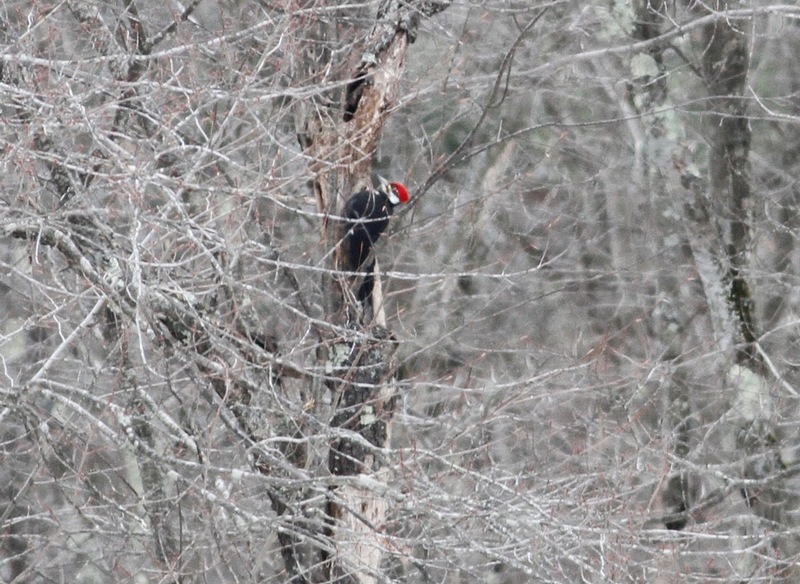 Pileated Woodpecker - Ben Hale Road, Gill, MA. March 25th, 2014. 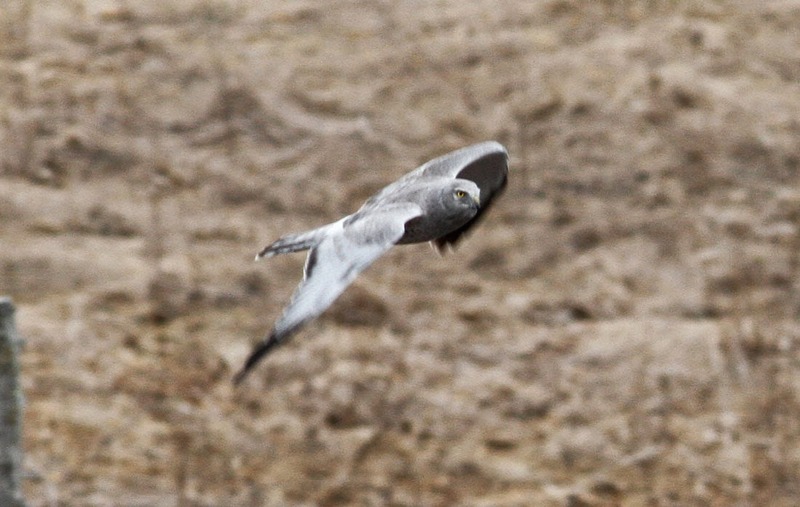 Great spotting by Martin to pick up this drumming male. 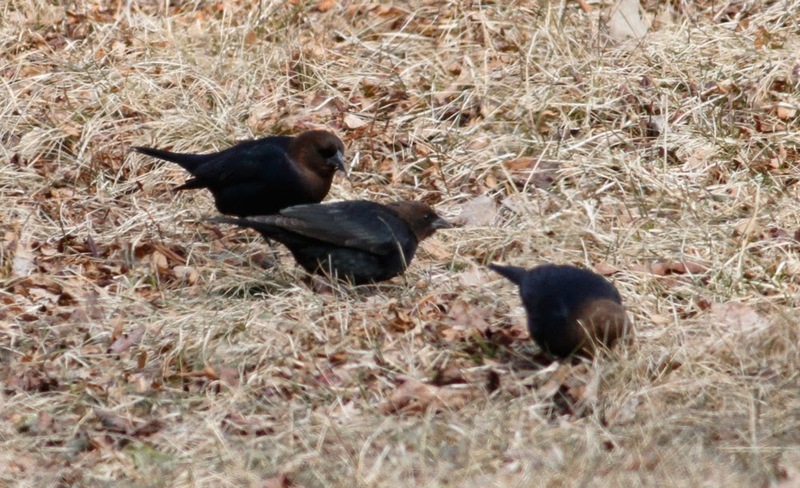 Brown-headed Cowbirds - males, West Northfield, Franklin Co., MA. March 25th, 2014. 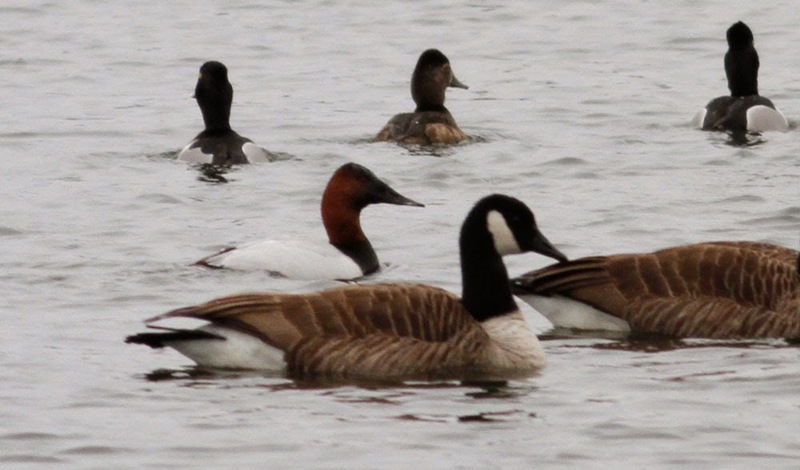 Canvasback (center) - male, Barton Cove, Gill, Franklin Co., MA. March 25th, 2014. Extra-ordinary head and bill shape! Continuing from March 12th. Yet another frigid start to the day (14 deg F/ - 10 deg C). Had a quick run down to Barton Cove finding most the recently reported species with the exception of the Redhead. 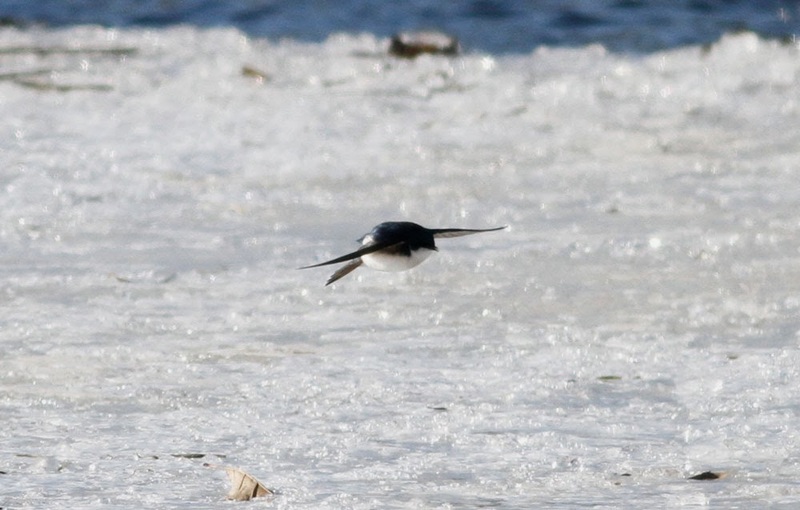 New for me was an American Coot and eight very poor looking Tree Swallows - certainly a sobering sight to watch these poor migrants hawking for insects and picking from the surface of the ice. The survival rate for this first wave of migrants cannot be very high. Looked like a puff-ball on wings. 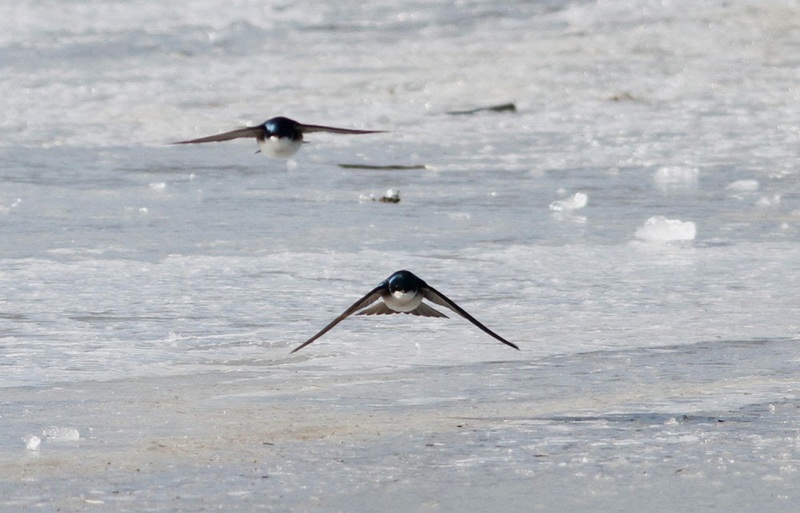 Tree Swallows - over the ice, Barton Cove, Franklin Co., MA. March 24th, 2014. 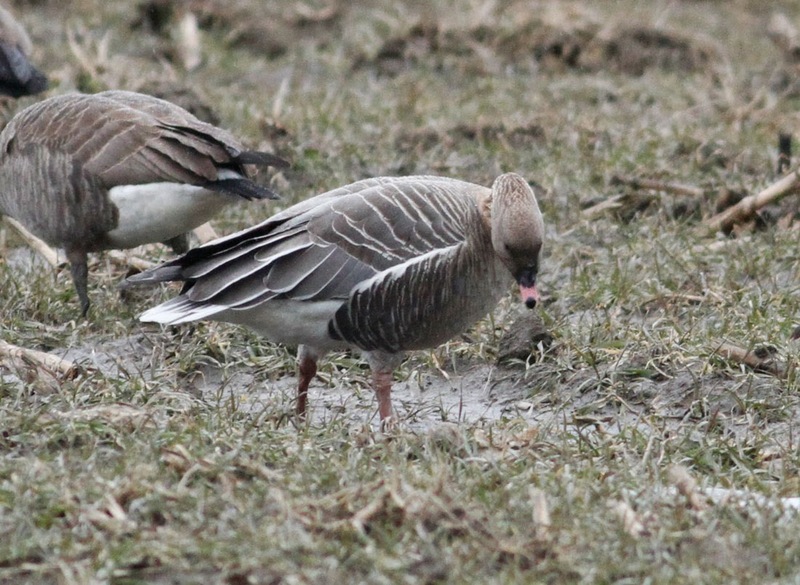 With yesterday's Whately Pink-footed Goose still very much on my mind, I headed south hoping to find it in the same fields that it was reported yesterday. It turned out to be a classic 'wild goose chase', the bird was apparently being seen in Hadley unbeknown to me as I drove south. But in essence it didn't really matter. 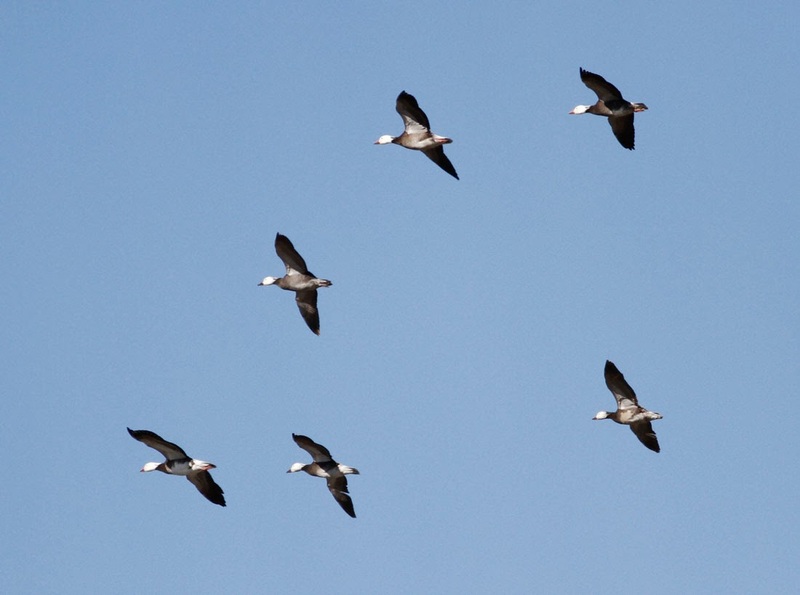 As much as I love geese, I have seen Pink-footed in the 'Valley' before and I actually became much more entranced with a tight flock of blue-phase Snow Geese moving in and out of the Canada flock. The birds came and went, seemingly quite skittish and far more easily spooked than the Canadas. I never did see the Pink-footed Goose but went home more than happy with these blue snows. Blue Snow Geese (6) - Whately, west side of River Road, Franklin Co., MA. March 24th, 2014. 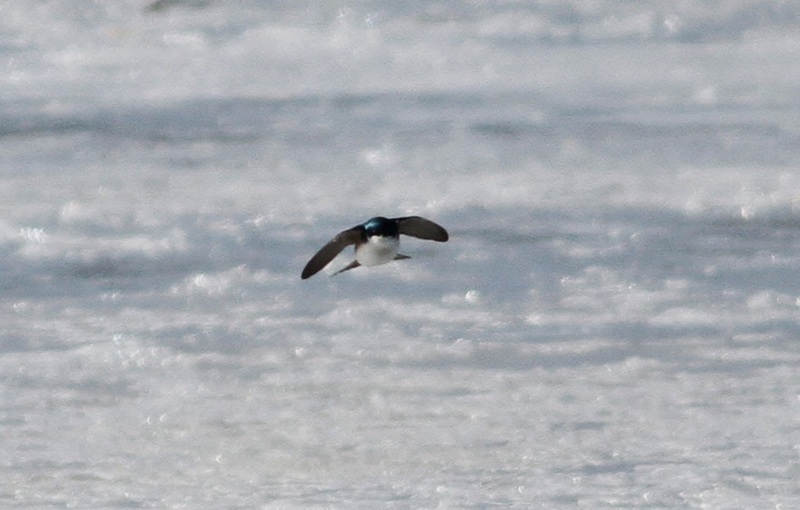 This morning, Susannah, Matan and I had a drive up to Vernon, VT to, once again, try for the regularly reported wintering drake Barrow's Goldeneye. When we got there, a visiting birder from New York state told us that he'd be stationed by the CT River for two hours with out seeing the Barrow's despite working through the distant flock of Common Goldeneyes present downstream. In the search, it was a real pleasure to see our first swallows of the year hawking over the river, about five Tree Swallows in all. As we were about to leave, Dave Hof showed up and again we had another scan of the river, again without success. This particular Barrow's continues to be aloof for us. 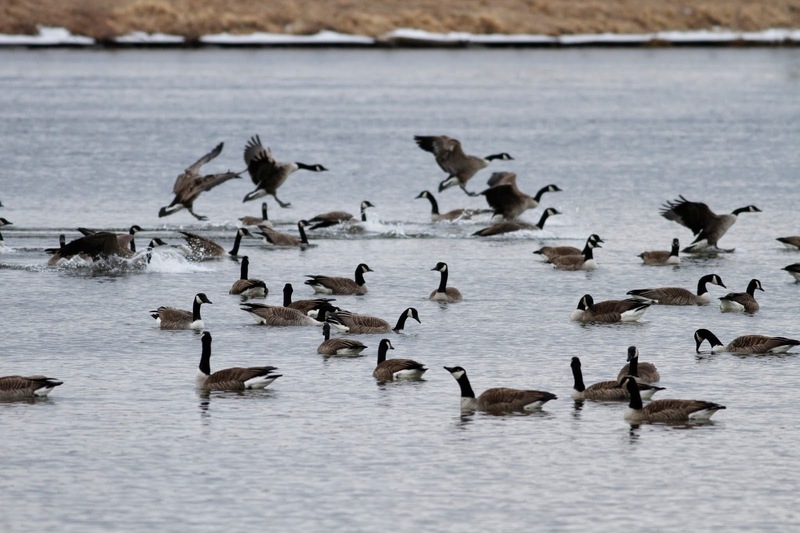 In the mean time Canada Geese were a lot more obvious all over our area today, and Hector Galbraith reported a huge flock of 2500 above Vernon Dam this morning along with about 90 Snow Geese. 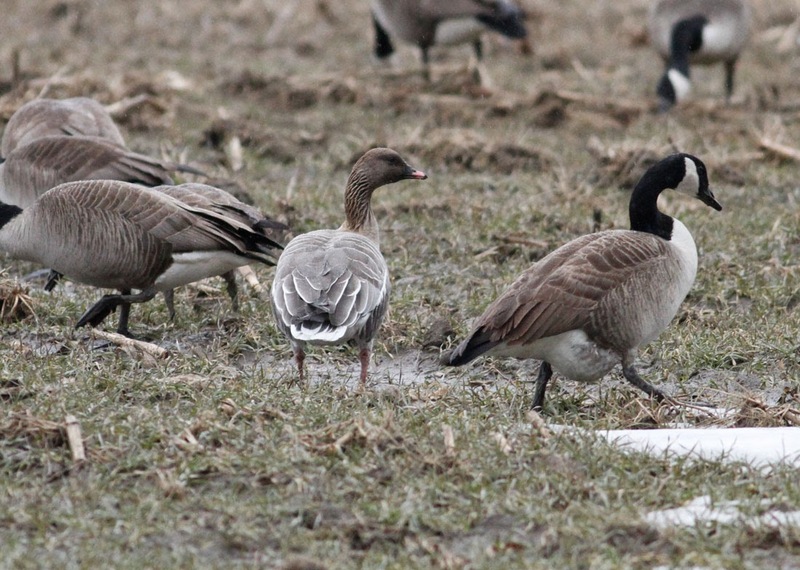 Much farther south in the valley, Larry Therrien was fortunate enough to find a Pink-footed Goose in Hatfield/Whately in the afternoon. 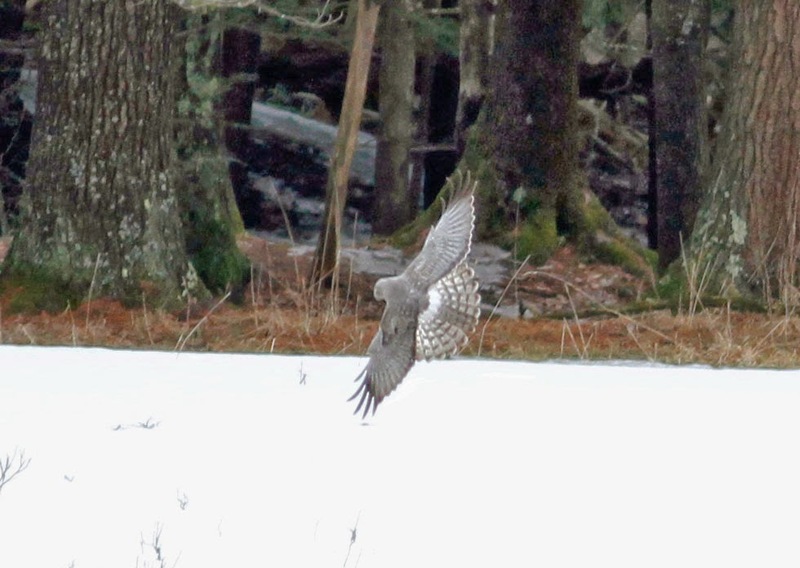 I'm sure we'll get a full report soon on Larry's own blog, but I think congratulations are in order for one of the most active birders in the Pioneer Valley. Well done Larry - hopefully more on that one to follow. 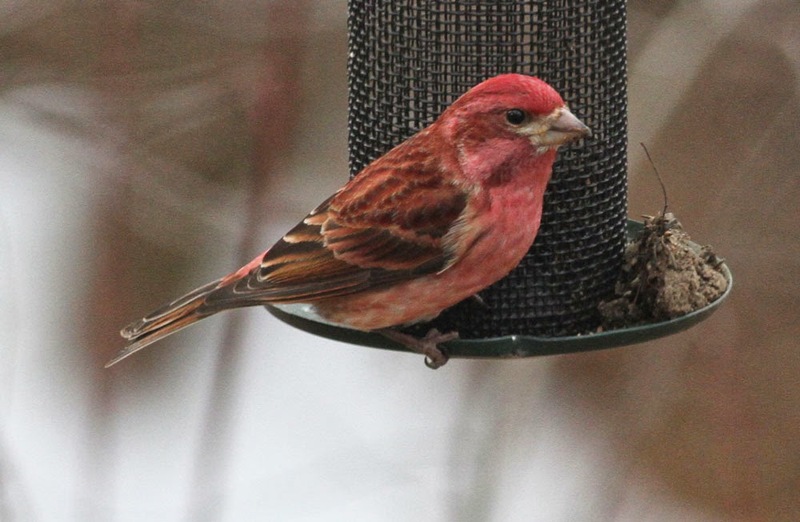 Purple Finch - male, Gill yard, Franklin County, MA. March 23rd, 2014. Beatifully bright male taken through the glass of the living room window! 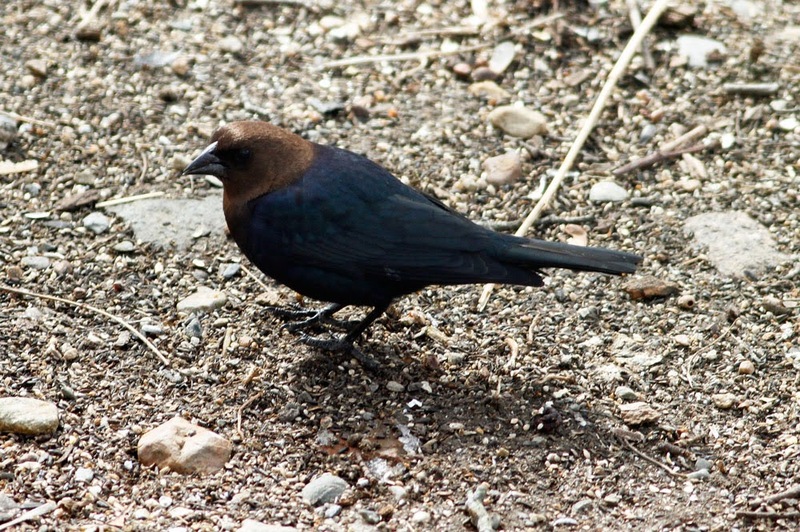 Brown-headed Cowbird - male, Gill yard, Franklin County, MA. March 23rd, 2014. Bald Eagle - adult, Vernon, Windham Co., VT. March 23rd, VT.
Tree Swallow - Vernon, Windham Co., VT. March 23rd, VT.
Mega distant crop of one of five Tree Swallows about 1/2 mile downstream from our viewing point. At home in Gill, Purple Finches continue to be a feature with several singing males along Main Road including a fine, bright male at our feeders this morning. A pair of Brown-headed Cowbirds were present too, cowbirds being fairly infrequent visitors to our feeders. 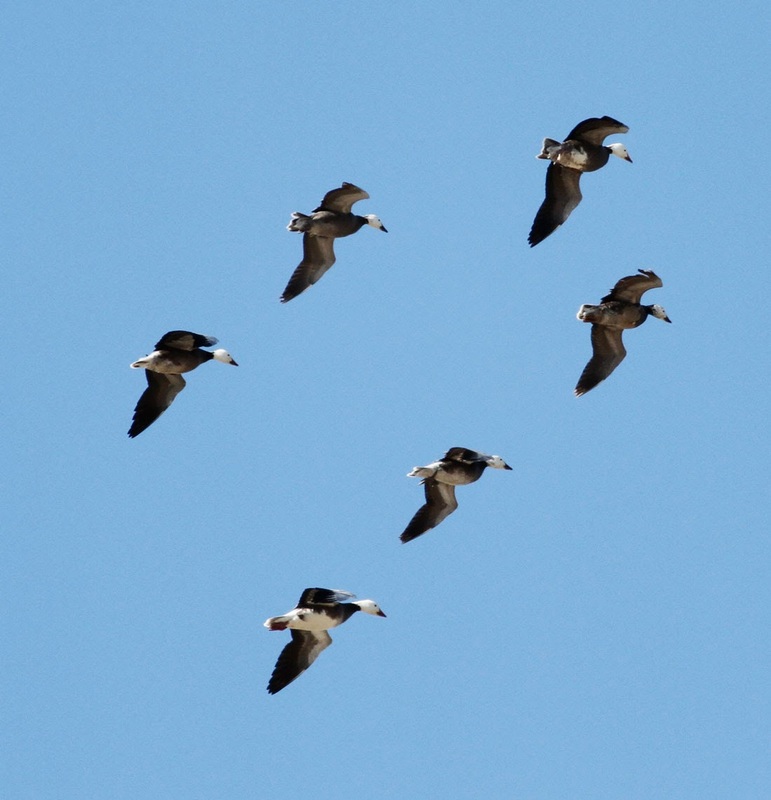 Canada Geese finally arriving in decent numbers. Not thousands yet, but certainly some hundreds arriving at Turner's Falls power canal this morning. 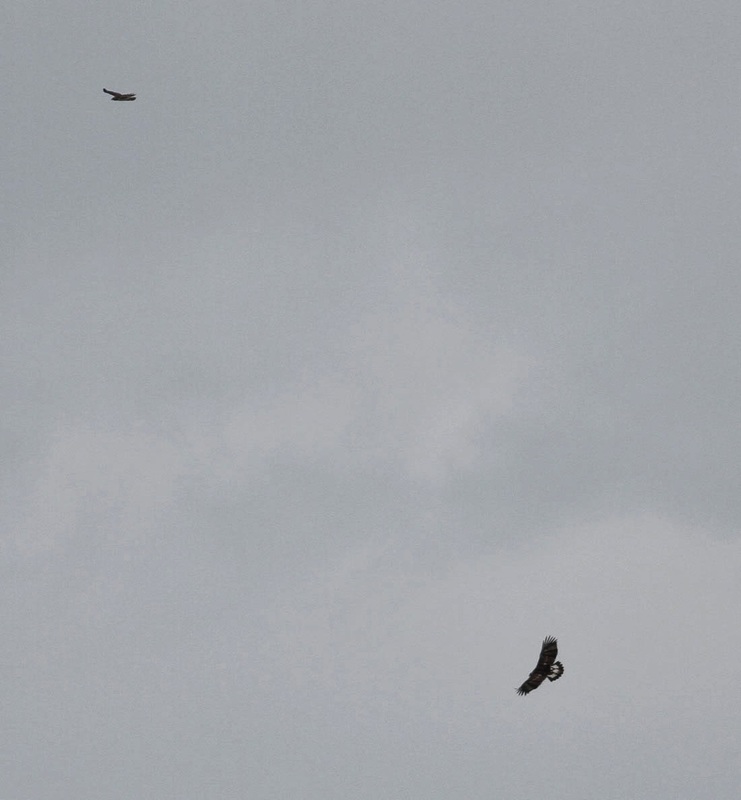 Just as I was settling down to enjoy them an adult Bald Eagle came along and flushed the lot! 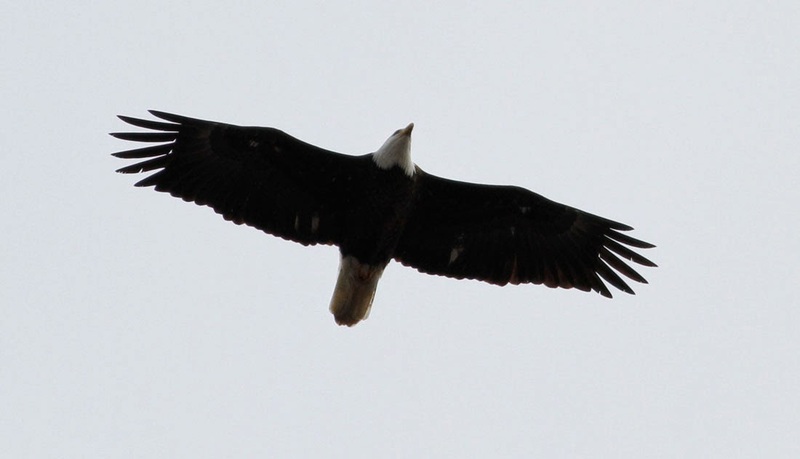 In fact Bald Eagles were distinctly active this morning with no less than five at Barton Cove including an adult carrying nest material and three different immatures (two dark, one light). Waterfowl action was consistent with pervious visits this week and all the 'lesser rarities' continued - Canvasback (2), Redhead (1) and Long-tailed Duck (1). 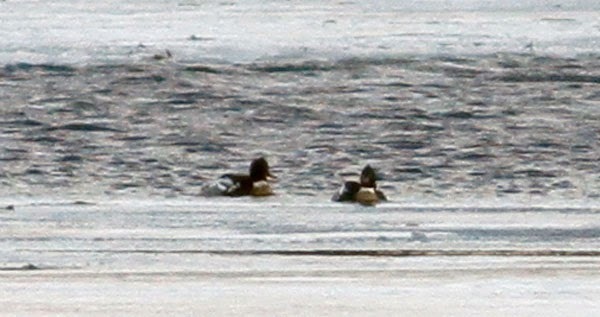 The drake Red-breasted Mergansers were also present, the first time I've seen them in several days. 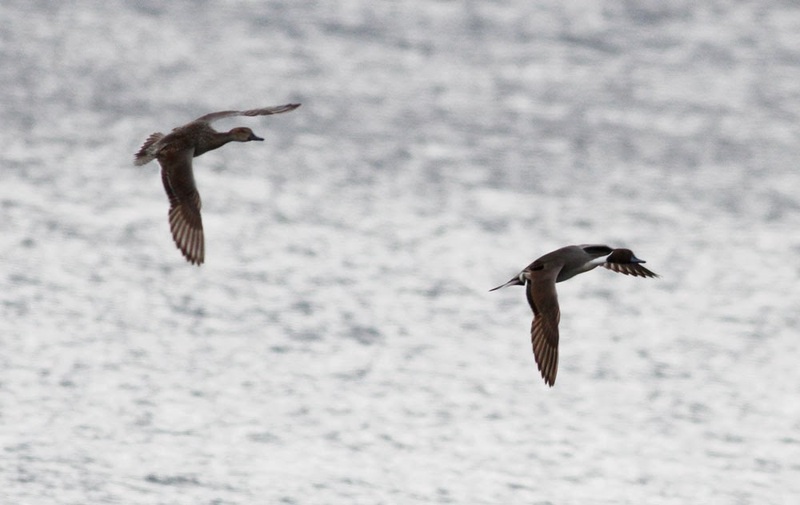 Norther Pintail - pair, Riverview Drive, Barton Cove, Gill, Franklin Co., MA. March 21st, 2014. 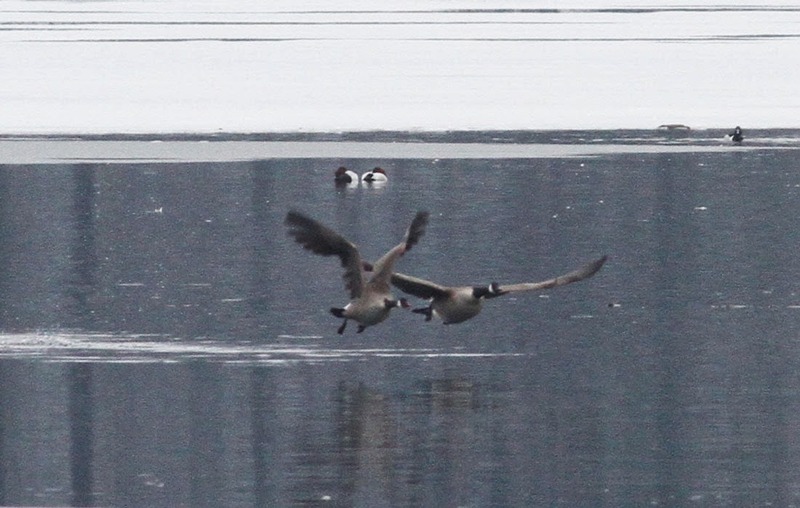 This pair appeared very briefly before disappearing and I only saw them in flight. Red-breasted Mergansers - males, Barton Cove, Gill, Franklin Co., MA. March 21st, 2014. 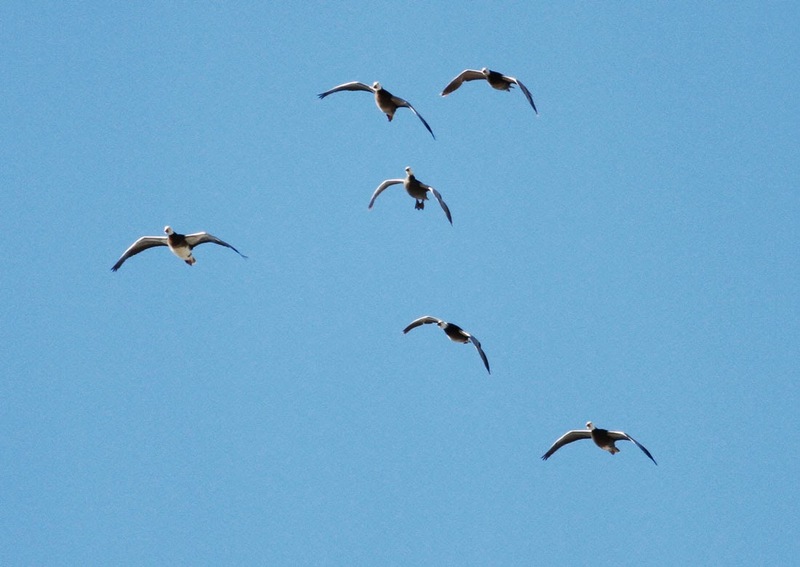 Heavy crop of extremely distant birds. A couple of local year firsts today with an American Woodcock displaying over Boyle Road, Gill and a Killdeer in a field just 200m NE of our home on Main Road, Gill. Both were heard pre-dawn (insominia does have some advantages!) but the day was hardly spring-like with raw winds from the northern quarter and squally snow showers. Canada Geese - Turner's Falls power canal, Franklin Co., MA. March 21st, 2014. Newly arrived birds coming in from the south. 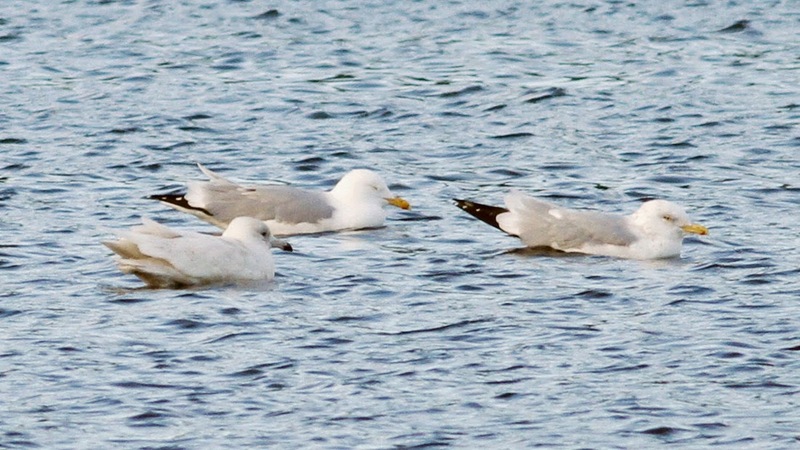 Kumlien's (Iceland) Gull - first-cycle (center), Unity Park, Turner's Falls, Franklin Co., MA. Glaucous Gull - first-cycle (left), Unity Park, Turner's Falls, Franklin Co., MA. March 21st, 2014. A quick peruse from Unity Park in the evening found the two Canvasbacks and Redhead loafing with just five Greater Scaup and not with the main raft of Ring-necked Ducks which were still way out in Barton Cove. A smattering of large gulls off Unity Park included a first-cycle Kumlien's Iceland Gull and the continuing first-cycle Glaucous Gull. Much to my surprise, another overnight winter storm yielded little in the way of fresh waterfowl at Barton Cove and it was pretty much business as usual - 65 Ring-necked Ducks, a dozen each of Common Goldeneye and Common Merganser, two drake Canvasbacks, Redhead and the female Long-tailed Duck. 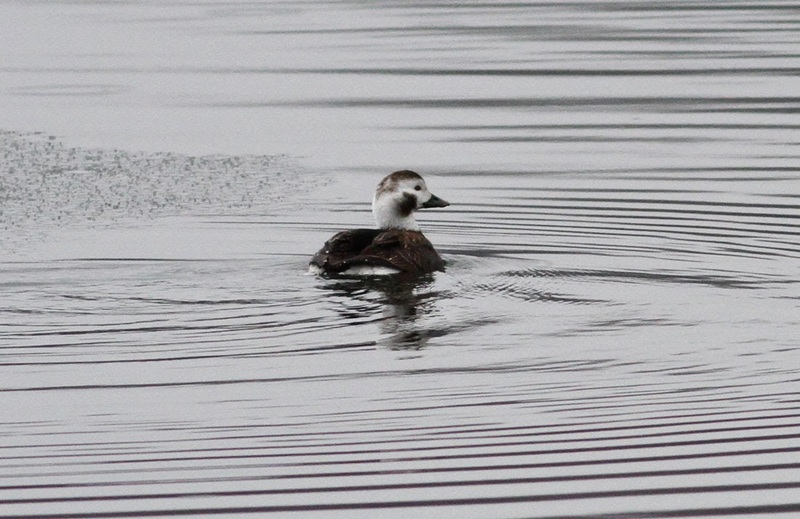 Of these, only the Long-tailed Duck was close, in fact as close to Riverview Drive as I've seen it during its stay. 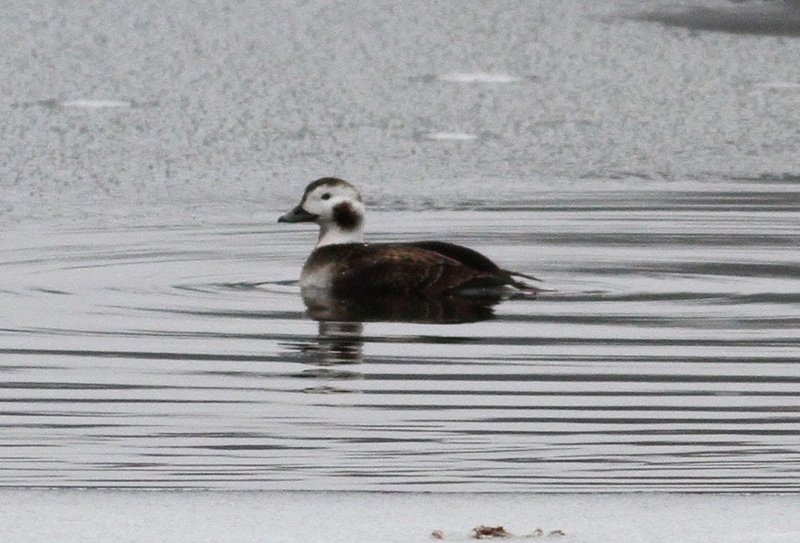 Long-tailed Duck - female, Barton Cove, Gill, Franklin Co., MA. March 20th, 2014. Continuing bird from March 15th. Canvasbacks (rear) - males, Barton Cove, Gill, Franklin Co., MA. March 20th, 2014. Continuing drakes a lot more distant in the last few days. Common Goldeneye - first-winter male, Barton Cove, Gill, Franklin Co., MA. 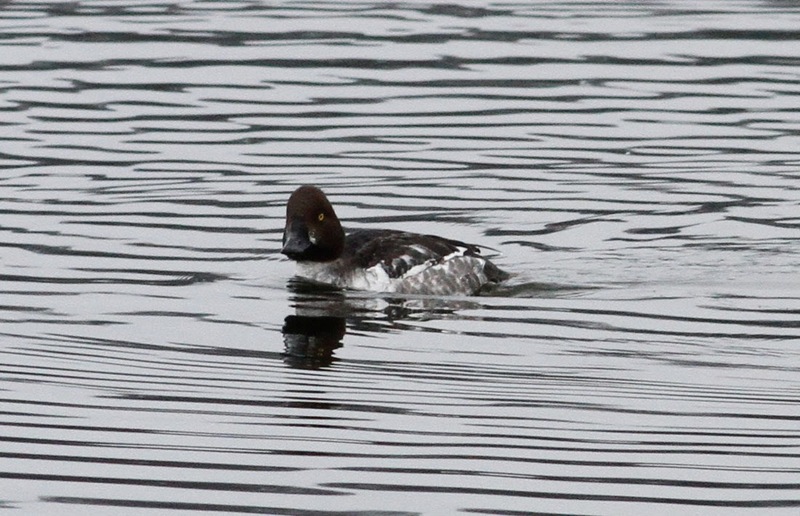 March 20th, 2014.
and bill shape were much more in keeping with Common Goldeneye. 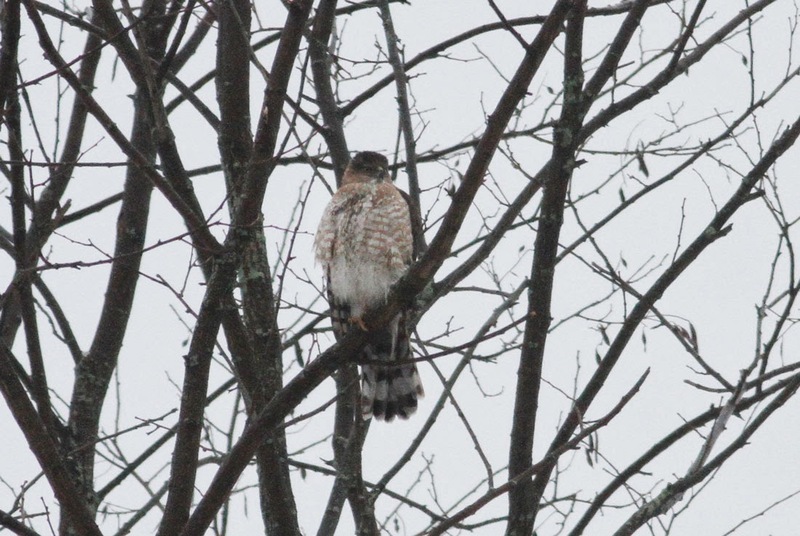 Cooper's Hawk - female, West Gill Road, Gill, Franklin Co., MA. March 20th, 2014. 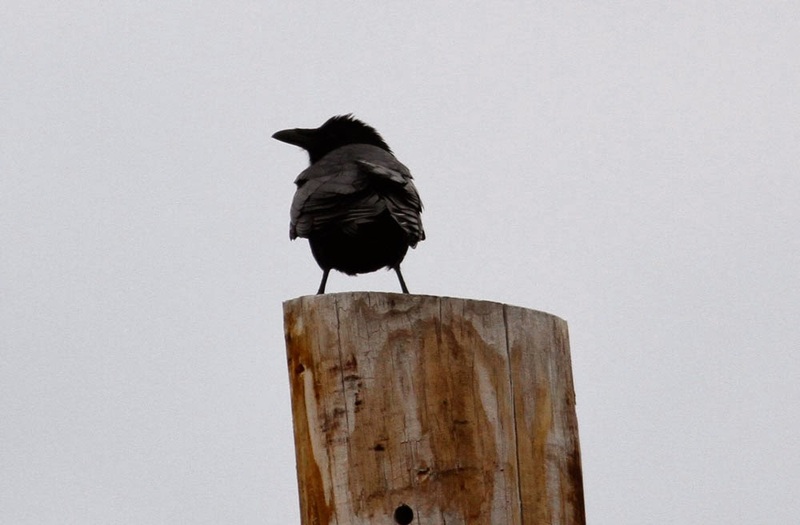 Huge bird, fanning its tail and drying out in roadside trees after a night of 'wet snow'. Canada Geese - evening arrival at Barton Cove, Gill, Franklin Co., MA. 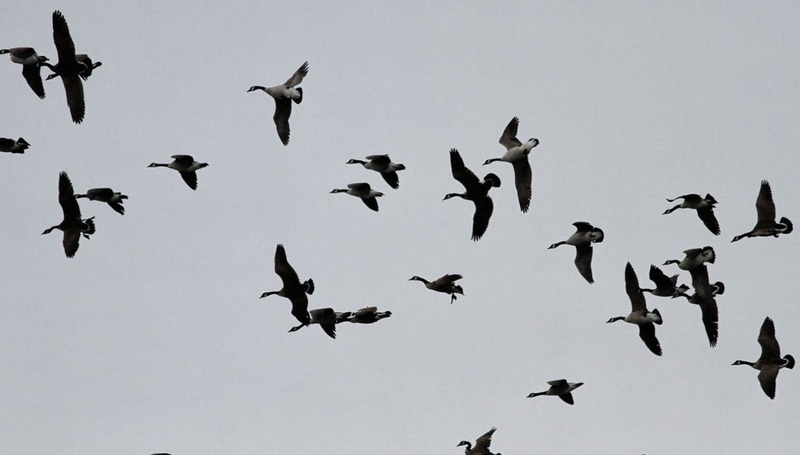 March 19th, 2014.
migration which seems incredibly late this year., at least in our part of Franklin County.